Legendary comics creator, Garth Ennis returns to the grueling survival world of the Crossed to tell a special tale of survival at any cost. Ennis brings readers into the viceral world of misery he created and invites you to experience true uncencored horror. These stories are not watered down for age ratings or edited with any other purpose other than to tell stories of a world overrun by maniacs. There is no help. There is no hope. There is only the Crossed. 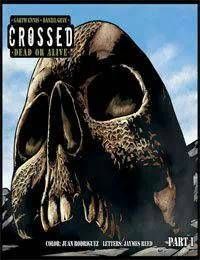 Crossed DOA collects the original webcomics by Garth Ennis and Daniel Gete.